So said David Grant OW (1970-1978), the recently retired, Cambridge University educated, Consultant Geriatrician at The Royal Infirmary of Edinburgh. Unable to attend in person on that Saturday evening in September, his message was delivered on the big screen in the Visitors’ Room at the Malmaison, Oxford Castle; his observation about Whitgift’s headmaster for 21 years from 1970, was met with universal approval by those in attendance. In an article reviewing ‘Oedipus at Colonus’, published in the ‘Financial Times’ (15th June 2018) Robin Lane Fox described David Raeburn as, ‘The King of Greek Dramatic Productions’; the play had been staged to great acclaim at New College over this summer. “If Sophocles was in his eighties when he wrote the play, Raeburn had just turned 91 when he directed it. I mean it. He had translated the entire play, adapting his English to give its hearers a sense of the rhythms of the choral songs. He had conceived every movement, every nuance of delivery and use of space. He had cast the play with the sharpest of eyes, drawing on undergraduates and graduates to whom he still teaches classical Greek.” After the play had completed its run and prior to his attendance at the Class of ’78, David led a reading group of students on a trip to Greece. Extraordinary. Seventy-five had gathered for the weekend festivities for “The Class of ‘78”. David Raeburn was appropriately made the weekend’s Guest of Honour. The level of affection for him was a remarkable endorsement of the respect with which he is held and recognition of the rounded, liberal and ethical education that he sought for his students. After a lengthy soirée where guests were served with Champagne and canapés, and a four-course dinner washed down with equally good red and white Riojas (thus disproving that a good Spanish white is a red), David Raeburn stood and delivered with clarity a remarkable speech, erudite, incisive and enthusiastic, without notes and no mic. As the school’s former headmaster concluded talking on that September night, all the guests rose as one, their applause seeming to last forever, applause that must have been ringing in David’s ears long after he had got back home. It had devotion and fondness that few headmasters at any school will ever experience; his students and former colleagues in attendance had responded as was merited in a manner so emotionally charged as to be unforgettable. Earlier in the evening Peter Gibson (Whitgift Master, 1965-2003) spoke. Having given so much to his students across CCF, sport, school plays and his English classes, and being known for his kindness in the provision of pastoral care, Peter’s words were received by a supportive audience held in rapt attention. ‘Gibbo’, as he is affectionately known, offered an expert and carefully thought out analysis of the changing culture of the school across three headmasters. It was a glowing tribute of Whitgift under David Raeburn, and if one were to pick out one of the many attributes that Peter believed made him such an effective headmaster, one would select David never having made a decision with self-interest at its heart. To be regarded as the most selfless of men is true leadership. Julian Gunn OW (1970-1978), another of the Class of ’78 who graduated from Cambridge, is Professor of Interventional Cardiology, Honorary Consultant Cardiologist and Insigneo Fellow in the Department of Infection, Immunity and Cardiovascular Disease at the University of Sheffield; he spoke on behalf of the Class of ‘78, fifty of whom were in attendance, expressing his enormous affection for Whitgift and adding to the words of David Grant in elaborating further on the essential humanity of the school under David Raeburn and the importance of the values it engendered. Simon Lambert OW (1970-1978, School Captain 1978, Consultant Orthopaedic Surgeon, University College London Hospital NHS Foundation Trust, Honorary Consultant Surgeon, Great Ormond Street Hospital for Children NHS Foundation Trust, Honorary Senior Lecturer, UCL), proposed the toast for the Headmaster. Emcee Francis Charig OW (1970-1978, Senior Director at Baillie Gifford Shin Nippon PLC and a World Economic Forum Technology Pioneer) told various lighthearted stories and read to the guests a story about David Raeburn from ‘Memories of Whitgift’, a book that Francis said included two of his own stories although he pointed out that he had been given the nom de plume of ‘Chang’ in the list of contributors. What has been written so far might mislead. There were actually very few formalities. It was just one part of the itinerary for a weekend reunion of the Class of ’78. This was the most informal of events, no black tie in sight, very few ties at all in fact, jeans proliferating, relaxed. 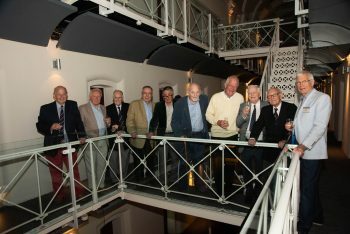 With most of the attendees not having seen any of their school year for four decades, they returned to recollect with their friends and to appreciate their headmaster. There was real interest in seeing that everyone was healthy and happy, little or no interest in comparing. That the year had produced more than its share of talented doctors, accountants, lawyers, bankers, teachers, research scientists, civil servants and businessmen was immaterial; it was the inherent decency of the former students that mattered most and this was the best endorsement of the success of the Raeburn years at the school. The Class of ‘78 was the first to have both begun and ended its time under David Raeburn’s leadership, a true reflection of this remarkable man at his Whitgift School.